I have been asked about the design and origin of the statue on my working logo for my debut book, Estate of Horror and featured in the Book Teaser. This statue is a direct link to my deceased friend who is the subject of my book. As you may know by now that the reason I became involved with the paranormal is because of my responsibilities as an Executrix (female Executor) to this friend’s estate. The statue of the “Veiled Lady” was among his many hundreds of items and artifacts he collected and left behind and willed to me. He was an anthropologist, teacher, writer and lecturer and my friend for 30 years. The statue had been used in some of his lectures on the history of early Victorian customs and practices. The statue is a replica of a sculpture made in England in 1850 by artist Raphaelle Monti. 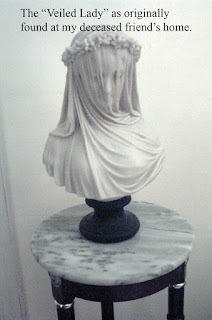 The exquisite technique and treatment of the veil over the woman’s face was originally sculptured in Cararra marble. It was purchased and owned by an English lord, the Duke of Devonshire. Although the statue depicts a young maiden on the eve of her wedding, it now became a somber symbol to me, given the tragic circumstances of my friend’s sudden death, of a figure shrouded in mourning. I felt that this statue was a unique icon for the book cover and it evolved into the focal point for my Book Teaser video because of the chilling paranormal experience we had at my friend’s home concerning the statue. I can’t give away the horrific sequence of events of what happened, so I guess you’ll just have to read about it when the book comes out. Or you can watch the Book Teaser. A fact is all the props in the video came from my friend’s estate. The many cultural statues, figurines, dolls, books, magazines, film slides, post cards, photos and “haunted” typewriter featured in the video are symbolic to the chapters in my book. Even the color red has meaning. Some things I have posted online on my Facebook page: www.Facebook.com/EstateofHorror from the video production feature some very strange and unexpected events that occurred during the filming of our Book Teaser in July 2012 that we are not able to explain. You can see "Spirit Orbs" in the photos here that we did not see until after we reviewed 100 still photos of the production shoot. 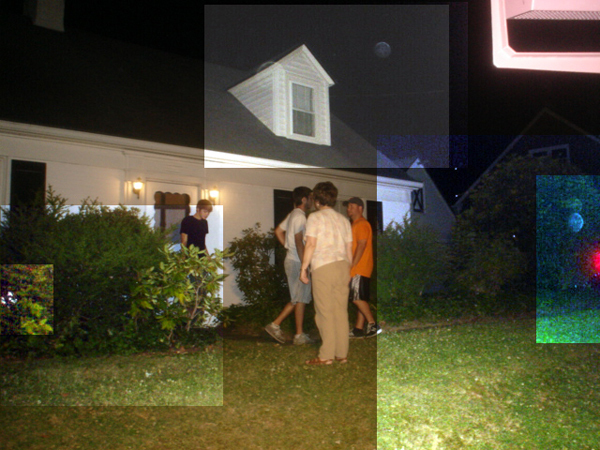 There were at least 8 photos with anomalies on them. Looks like the spirits were not camera shy. You can see these photos and other continued weird postings on my Facebook page. BOO! 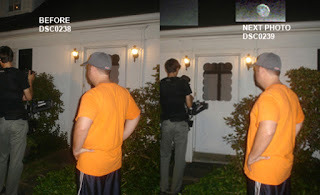 At the beginning of the video, as the door slowly opens and creaks, you see a shadow figure wearing a brimmed hat reflected on our white door and just before that there is a brief 2 second EVP of a dog barking. Our producer and crew said no one heard any dog barking or noise when they were filming this video (around 11pm that night) and no one in the crew was wearing a hat. Our brimmed hat shadow man came to my son (who has become a medium) in a dream months before and told him was a former resident who murdered his wife in the early 1900's. My son described him as wearing farmer's overalls and a brimmed hat along with his companion -a large black dog with red eyes. We researched in county records (our property dates to the early 1800's) and indeed a former owner went to prison for murdering his wife in the 1900's. Watch and enjoy a few shivers down your spine!